It's a one day event, so don't risk missing this strange little festival. 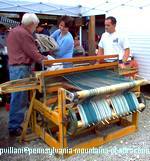 Enjoy an old fashioned strange little PA Festival, complete with handmade crafts and gifts. 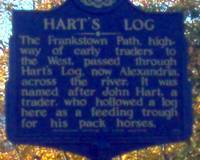 "Hartslog Day", an annual event celebrated in Huntingdon County's Alexandria, PA. It's a one-day Annual Heritage Event celebrated in October. Join in the celebration only a PA Harvest can offer. The annual Halloween tradition wouldn't be the same without PA Festivals. You'll find homemade holiday crafts and gifts at every turn. Take home some homemade soap and beauty products, canned jellies and homemade candies, you'll even find some homemade treats for your pets. You just never know what you'll find and what inspired each artist to create year after year. The one requirement of this event is, anything that is sold on Hartslog Day must be a handmade craft! You'll find a variety of vendors lined up along the streets, front lawns and porches of this small community. As you browse through the streets you'll see crafts that will amaze you. The artistic workmanship is, without a doubt, inspiring and a unique quality rarely seen. Even though this strange little PA festival is only a one day annual event you'll see thousands of people flocking down main street to enjoy this unique festival. The friendly community, unique homemade crafts, entertainment and great homemade food is what keeps people coming back year after year. 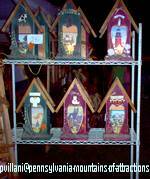 The lists of handmade crafts and holidays gifts are endless. The community of Alexandria, PA goes all out for this strange little PA Festival. 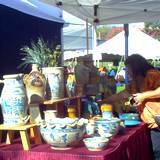 Artists create almost all of the homemade crafts locally. Many of the crafts and their creators have been taught the art from past generations that have made this historical area the community it is today. Bring your holiday shopping list and your appetite. You'll find plenty of food booths with ethnic foods and drinks. The food is all made locally with special recipes and homegrown ingredients. The local church offers a big breakfast to start your day. Then the local Fire Hall heats up the grills and supplies the festival with their famous Chicken Barbecue. You won't find chicken like this at a fast food joint. Best of all, the prices are so family friendly you'll probably want to take some home. There is also an area set up for the youngsters to enjoy. You'll find plenty of children's activities to keep them busy while you're shopping or just in need of a rest. 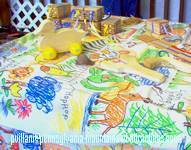 When was the last time you bought your child a handmade wooden toy? These toys are not only built to last through generations of children, they are also educational and interactive! You never have to worry what country items came from or what materials were used to make them. You can buy with the peace of mind that everything was handmade with the best materials money can buy. There will be plenty of family entertainment. From local bands, singer/guitarist, to the music of a select chorus. It's a full day of old fashioned fun, activities and entertainment. It's a strange little PA festival you're going to fall in love with. 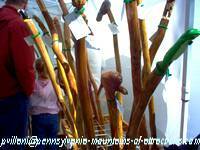 It's one of our last Fall PA Festivals before Pennsylvanians settle back for a long Winter. You might be interested to find another out of the ordinary Halloween tradition celebrated in the Allegheny Mountains. It's called All Saint and Souls Tour at Mount Assisi. Here you can actually interact with historic Catholic saints as you walk through a guided tour of Mount Assisi. A licensed Indian trader in 1744, John Hart used a large hollowed-out log to feed and salt his horses while he conducted his trading. Early settlers used this "logg" as a landmark to describe the location and their claims and referred to this area as Hartslog Settlement. In 1793 this area was laid out into town lots and named Alexandria, with the street near the site of the log name Hartslog Street. Today the name remains for Hartslog Street as well as Hartslog Valley, and Hartslog Grange, and of course, the strange little PA Festival, Hartslog Day. It's not your ordinary old fashioned heritage folk festival. It's much more than that, but you have to attend Hartslog Day to understand what makes this PA Festival different from the rest. The Hartslog Museum located in Alexandria, PA is only open one weekend a month. It's always open for the PA Festival Hartslog Day. 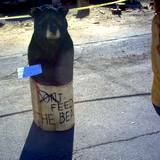 You'll find the history of Huntingdon County PA and John Hartslog. If you're a history buff you'll find the Hartslog Museum a place of rare history. You'll especially find the history behind the Canal Basin, Indian tribes, Indian traders, and John Scott. John was born and raised in Alexandria. He was the only man born in Alexandria and elected to the U.S. Senate. While visiting the museum you'll see many artifacts and antiques from this area and the era when Pennsylvania was still inhabited by Indian tribes. You'll also find many rare books and pictures. 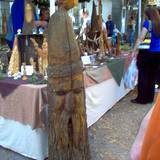 The strange little PA Festival "Hartslog Day" handmade crafts celebration helps support this fascinating museum. You'll find plenty of good food, good entertainment, and lots of handmade crafts to get an early start to the shopping season.